A federal law enforcement source said the information is largely intended for foreign carriers and the generic threat is not directed at the U.S. homeland. The Russian government has been informed, the source said. 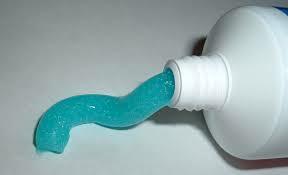 Going to the Olympics, leave your toothpaste at home. In an interview with CNN’s Jake Tapper last week, U.S. President Barack Obama said that he believes “Sochi is safe.” Great, this coming from the man who said, if you like your healthcare plan, you can keep your health care plan. Some how this is hardly a vote of confidence for the Winter Olympic Games. The Olympic represent the pinnacle of National pride for the host country and for the athletes who represent their own countries competing in the games. But as reported by CBS News, Americans might be hard pressed to find the stars and stripes and team USA logos in Sochi. The Olympic committee told the US athletes not to wear anything that identifies them as American in public. Sadly, the gutless Barack Obama/John Kerry State Department agrees. So athletes and fans are not supposed to show pride and patriotism in the US, they are supposed to cower in fear. Why even go if that is the case? This speaks volumes of our current federal government an namely Barack Obama, doesn’t it!!! It would appear that the motto of the Olympics of Citius, Altius, Fortius (faster, higher, stronger) has been changed to take part in your sport under the cloak of anonymity and hide from those who would kill you. So let’s understand this, the US is succumbing to the threats of terrorists? Really? We are allowing terrorists to dictate what we do and how we act? What a gutless government we have. Sorry, but if the Olympic committee was really serious about any of this they would have never granted the Winter Olympic games to be held in the middle of a terrorist hot bed. How bad is it that athletes who have trained their entire lives for this one moment in time have to ask their families to stay how for safety reasons? What the hell was the IOC thinking in granting these games in the first place? Hey, I say the Summer games should be held in Egypt, Syria or Iran next. It makes about as much sense. Has anyone ever told the IOC, Barack Obama and the State Department that you do not appease bullies, you stand up to them? Terrorists pride themselves upon fear and sadly Obama is showing that he is just that weak. Will the Sochi Winter Olympics be terror free or are wee about to see terrorism on a world state in real time with social media 24/7? Ahead of the Sochi Winter Olympics and with previous video threats of terror acts promised to take place and with Russian authorities on high alert, it is now being reported that teams from Germany, Hungary, Italy, Slovakia and Slovenia have received terror threats not to send their athletes to the games. Authorities are already on the look out for “Black Widow’s” and other terrorists ahead of the games. Needless to say, talk about a dicey situation. The Olympic teams of at least five countries said Wednesday that they had received emails threatening attacks at the Winter Games in Sochi, Russia, adding to mounting security fears two weeks before competition begins. The Olympic organizing committees of Germany, Hungary, Italy, Slovakia and Slovenia reported getting threats. According to Zsigmond Nagy, an official of the Hungarian Olympic Committee, he stated the following“I am very pleased to inform everyone that both the IOC and the Sochi organizing committee … declared after the analysis of the letter that this threat is not real,” “This person has been sending all kinds of messages to many members of the Olympic family.” Hmm, not sure how this individual is so sure. UPDATE I: The International Olympic Committee said Wednesday that the letter sent to the HOC did not represent any threat to athletes. I guess it all depends on how one defines a threat to athletes. However, the German team described the email as a “terror warning” with words to the effect of “be careful out there in Sochi” and the Italian Olympic Committee described the email as containing “terrorist threats.” That sounds much different that the IOC looking to present a positive front. “The IOC treats security issues very seriously and forwards any reliable information to the security services. However, it appears that in this case, the letter sent to the HOC does not contain any threat,” an IOC spokesperson told R-Sport. The Sochi organizing committee also assessed the letter and said there is no real threat, and that the author has also been sending messages to other countries competing in the Olympics, HOC international relations director Zsigmond Nagy told Reuters. 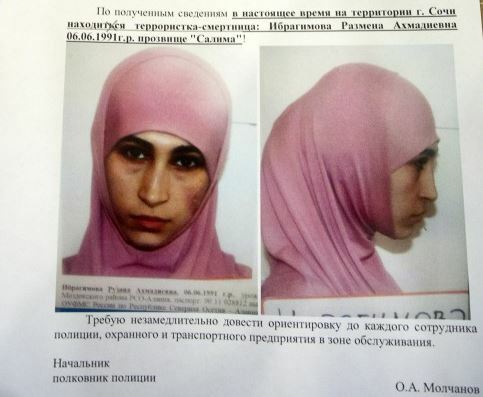 Russian security services and police are looking for Ruzana Ibragimova, the ‘Black Widow’ suicide bomber, also known as Salima, the 22 year-old widow of an Islamic militant killed by Russian security forces last year. Russian authorities distributed in pictures of the ‘Black Widow,’ Ruzana Ibragimova. The posters describe her as having a limp in her right leg, a left arm that does not bend at the elbow and a 4-inch scar on her cheek. It is believed that she may already be in Sochi. Now NBC News is reporting that there may be as many as four “black widows” dispatched to carry out terrorist attacks related to the Winter Olympics. It is believed that these terrorists may have already breached the so-called “ring of steel”. Things that Make You Go Hmm … Just curious, there was discussion ahead of the Olympics that they should be boycotted by the USA because of Russia’s laws against gays, yet it sounds like attending the Sochi Olympics is like playing terrorism “Russian” roulette and not a word about not sending athletes for their own protection. Police in Sochi have launched an urgent search for a possible female suicide bomber who may have already made it past the ring of security set up for the Olympic Games. Hotel employees in Sochi told ABC News that posters with pictures and descriptions of a 22-year-old woman from nearby Dagestan were distributed over the weekend by authorities and a similar flyer was also seen posted at Sochi’s airport. “As is always the case, we are working with the U.S. Department of State, the local organizers and the relevant law enforcement agencies in an effort to ensure that our delegation and other Americans traveling to Sochi are safe,” spokesperson Patrick Sandusky said. Ibragimova is described as having a 10 centimeter scar across the left cheek, a pronounced limp, and a stiff left arm that doesn’t bend at the elbow. VIDEO – CNN: Hunt for “black widow” bomber in Sochi. This announcement comes on the foot-heals of the VIDEO tape received by the two individuals that were terrorist bombers who promised to a “surprise package” to be delivered during the Sochi Winter Olympics. The real question is, are the Olympics safe from terror and how in the hell was Sochi ever given the Olympics in the first place? Not to worry, Barack Obama thinks that this is just the jayvee. UPDATE I: Russian police kill Islamist militant leader before Olympics. Police have killed a senior Islamist militant in a shootout in Russia’s North Caucasus ahead of the Winter Olympics in Sochi, the National Anti-terror Committee said on Tuesday. The shooting of Eldar Magatov, a suspect in numerous attacks on Russian targets, at a house where he had taken refuge in the Dagestan region was part of an intensifying security clampdown as the Games approach. Video Surfaces Threatening Terrorist “Surprise Package” for the Winter Olympics in Sochi … Are the Olympics Safe from Terrorism? A new video was posted Sunday on a Chechen terrorist extremist web site threatening terror attacks for the upcoming Sochi Winter Olympics in Russia. The video threatens jihad and that, “We’ll have a surprise package for you,” one of the men said in the militants’ video. “And those tourists that will come to you, for them, too, we have a surprise.” This comes on the foot-heals of two terrorist bombings in the Russian city of Volgograd. One was a suicide bombing at a train station killing 14, and the other aboard a trolley bus. Citing a new “surprise package” for Russia and Olympic spectators, Islamist militants in the North Caucasus Sunday launched a new threat to the Sochi Olympics with a purported “martyrdom” video by two suicide bombers who attacked a transit hub 400 miles away. The video posted on a Chechen extremist site considered a credible platform for militant statements featured two unidentified men before the black flag of jihad and cradling AKMS rifles. The duo — dressed in street clothes and without the usual trappings of jihadis — casually explained that Russians and those attending the Winter Games next month will not be safe as long as forces sent by President Vladimir Putin occupy the North Caucasus region near Sochi, Russia. The American Thinker asks, Can the Russians pull off a terror-free Olympics? My personal opinion is I sure hope so; however, I have to agree with TAT, I don’t trust the Russians to be competent enough either. Also, these Muslim, Islamist, Chechen extremists are highly motivated and off the chain insane when it comes to martyrdom in the name of Allah. I don’t trust the Russians to be competent enough to prevent attacks and protect the Olympics. To me, it’s not a question of “if” but “when” an attack will happen. People are willing to die to make Putin look bad. That does not bode well for the safety of tourists or athletes at the games. The U.S. State Department today urged Americans traveling to the Winter Olympics in Sochi in southern Russia to be “vigilant and exercise good judgment” during the Games because of the continuing terrorist threat to the region. The Russian government is devoting considerable resources to ensure the Sochi Olympics are safe and incident-free. Large-scale public events such as the Olympics present an attractive target for terrorists, as did the Olympics in Atlanta in 1996. Travelers should expect increased police presence and enhanced security measures in and around the Olympic venues. Acts of terrorism, including bombings and hostage takings, continue to occur in Russia, particularly in the North Caucasus region. Additionally, between October 15 – December 30, 2013 there were three suicide bombings targeting public transportation in the city of Volgograd, two of which occurred within the same 24-hour period. Other bombings have occurred at Russian government buildings, airports, hotels, tourist sites, markets, entertainment venues, schools, and residential complexes. There have also been large-scale attacks on public transportation including subways, buses, trains, and scheduled commercial flights. UPDATE I: Putin pledges stepped up security. Putin has pledged that visitors to Sochi for the Winter Olympics will be kept safe. “We will try to make certain that the security measures are not intrusive or too conspicuous, so they are not too noticeable for the athletes, the Olympics’ guests or journalists,” Putin said, according to the interview transcript. “But at the same time, we will do our utmost to ensure that they are effective. UPDATE II: Just curious, how in the hell did Sochi actually get awarded the 2014 Winter Olympics when it was in such a terror rich environment? How does the Olympic comity even contemplate a place like this in a hot bed of terrorism as the location for an Olympics? 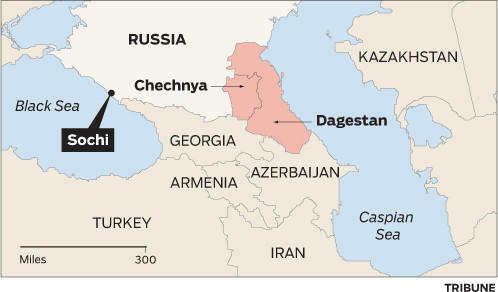 Sochi is due west of Grozny, Chechnya, and is about a 13 hour drive. Also, the Boston Marathon bombers, Tamerlan and Dzhokhar Tsarnaev, the ethnic Chechen brothers lived in Dagestan, which neighbors the Chechnya region in southern Russia. What’s there next pick, Iran, Palestine, how about Syria?